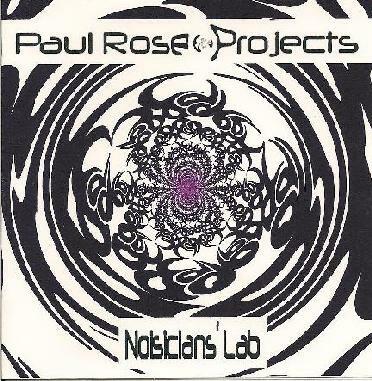 Paul Rose Projects - "Noisicians' Lab"
Well, there are noises, but this ain't any kind of "noise music" per se (and there is only one musician at work here)... just really clean melodic sequencer-driven space rock by the one-man-band of Paul; sounds like he has a pretty functional lab at his disposal here. His guitar plays a sweet and simple lead melody on this opening track Perpetual Curve, the sequencer plays a circular rhythm, the synth washes are cool breezes. Plectra View has a head-on-jam feel and swirly keyboard lines that definitely take you to the land of Ozrics! Love the guitar here which has a warm fluid richness... drums sound live, but maybe I'm fooled... good stuff. No Lie is a dubby pop song, and fittingly Paul's voice is also very clean... pretty catchy. Swirly Sea is another sweet space-rocker with another pretty lead-lick. Reason or Rhyme is the other song piece, maybe a bit too prog-poppy, but the keys still play some nice lines. The sequencer in Kinetic Shift reminds of early Anubian Lights. Closer Arctic War makes use of some heavier power-chords. Nothing too new here (at times even overly familiar-sounding), but pleasant.